Juanita's Diary contains her intimate notes. It was written between 1915 and 1919, probably at the suggestion of Mother Ríos of Sacred Heart high school in Santiago (where Juanita was studying). From a literary and historical point of view the Diary is not perfect: Juanita was writing from time to time, some times leaving it aside for months before resuming to write. What makes the Diary valuable is that it reveals Juanita's interior life. The first part of the Diary, dedicated to Mother Ríos when Juanita was 15, tells about her childhood. From September 1911 on, it adopts a different tone, much more intimate, since Juanita writes without thinking her Diary shall be read by other people. Thus she feels fully free and writes with spontaneity. One can read in these pages her intimate conversations with Jesus and Mary, the description of her efforts, her resolutions, her victories and failures on the path leading to holiness. Just before entering the Carmel Juanita thought about burning her Diary. She wanted to hide for ever the secrets of her intimate life. Her mother beseeched her not to destroy it but to leave it to her as a remembrance of her. Juanita accepted. It was only after the death of her daughter in 1920 that the mother opened the Diary and discovered the treasures contained in it. This was the way the Diary was preserved and became a means through which many people have been attracted to a life of prayer. 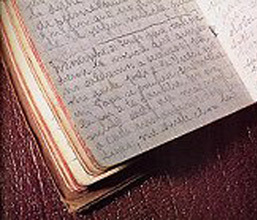 Thousand of people have read Teresa de Los Andes' Diary and through it have learned to grow in the love of Christ. Here are some passages of Juanita's Diary. Many saints left writings after their death. In the case of Teresa one should recognize that she never wrote in order to teach, nor did she leave an autobiography. She never took care to put into order her intimate reflections. Yet Teresa has become a master of Christian life for today thanks to her Diary and letters. She had not thought about it but God wanted it to be so. Teresa lived intensely and, thank God, her life was kept for history through her pen. "I call you friends for everything I have heard from I Father I let you know" (John 15:15). These words of Jesus could be applied to Juanita. Actually, she wrote to her mother: "I feel an insatiable thirst that souls may search for God" (Letter 104). 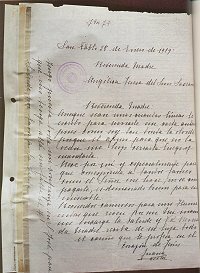 The recipients of the 164 preserved letters of Juanita are relatively few: her parents, her brothers and sisters, her spiritual directors, her friends and Mother Angélica Teresa, prioress of the Carmel of Los Andes. From the first letter, written when she was 10, until the last one, written on her death bed, it is impossible not to realize that the one who writes is full of God. While Juanita's Diary keeps the record of her experience of God, her letters communicate this experience in a way which varies according to the recipients: with her parents Juanita is tender, with her spiritual directors she is humble and obedient, with her friends she shows herself as she is: a friend wishing to share what is best in her heart. All her letters reflect the transparency of her soul and her burning love for God. One can see that the absolute love she has for Christ does not prevent her to love her neighbor, just the contrary. Here are some significant passages of Juanita's Letters. Letter of JUANITA to her brother Miguel.